Log data from utility meters and send the consumption readings to a central PC running Windows, with Biodata's new Microlink 840 data logger. Monitor demand in real-time and identify patterns of use of electricity, gas, water and so on. 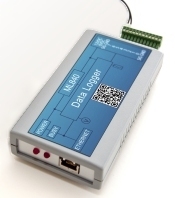 Can also monitor other parameters such as temperature and current. 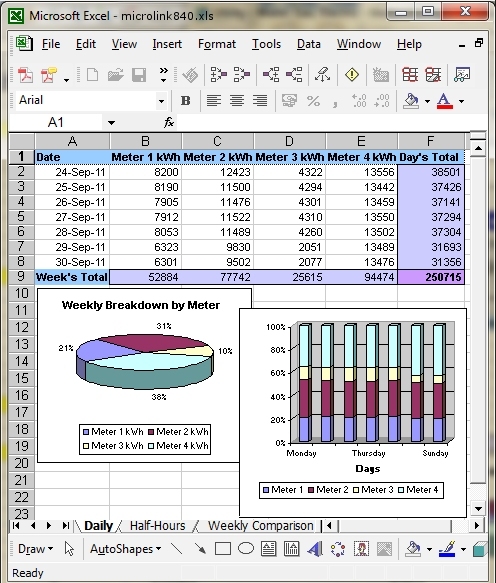 The modular Windmill software suite offers data logging, alarm indication and sends data directly to other applications like Excel. You can also add process mimic generators to create your own data displays involving live moving bars, analogue meters, colour coded alarms, control buttons, changing icons and time and date labels. Data can be passed to other software such as spreadsheets, databases and energy management software. The Microlink 840 costs just 295 pounds and is available on-line through Windmill Software's data acquisition shop. You can also buy direct from us - e-mail sales@microlink.co.uk or telephone +44 (0)161 834 6688. Whether bought from Windmill or ourselves we provide free technical support for life. If you would like to discuss your utility meter monitoring application please get in touch: e-mail sales@microlink.co.uk or telephone +44 (0)161 834 6688.